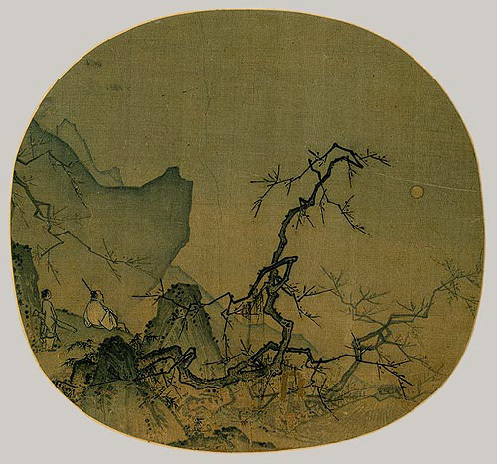 Since the early Northern Song period (960–1127), for intellectuals in the Song Dynasty, the plum blossom represented values of a scholar-recluse. Hence the imagery of plum blossom in Song Dynasty art and literature created by scholars often associated with scholar-recluse ideals. A scholar-recluse embraced and practiced integrity and intellectual independence. Tired of officialdom and disappointed at malfunction of the state policy, a scholar-recluse chose to forgo wealth and fame; they wandered in nature (to learn more about the landscape painting practice of scholar-recluse wandering in the wild, please refer to Margaret Hitch’s study), wrote poetry and made friends with like-minded scholars. The Northern Song poet Lin Bu (967–1028) lived a reclusive life in the Solitary Mountain by West Lake. It is said that he planted plum trees and raised cranes. Flowering plum was his wife and the cranes were his children. Many renowned scholars and officials at Lin Bu’s time responded to his poetry and character with admiration and congenial friendship. The circle of scholars in the Song Dynasty wrote poetry and essays to express their esteem to the independent mind that Lin Bu was exemplary of. The imagery of plum blossom therefore implies the character of a man of integrity and culture. In harsh winter when most plants could not survive, the plum tree flowers, emitting subtle fragrance in spite of snow and frost. The qualities of plum blossom are therefore concurrent with that of a scholar of elevated mind. 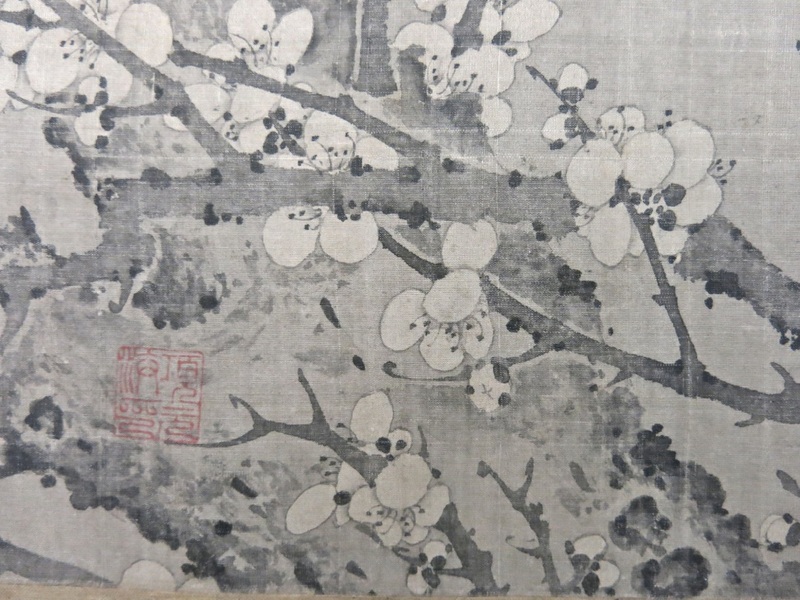 A number of poetry, essays, and paintings from this period were created by intellectuals featuring plum blossom, which served as an emblem of their pursuit. Court paintings treat the plum blossom with refined white pigment and often times portray plum blossom together with birds or other plants. The painters or patrons of the paintings seemed to attach more worth to the physical beauty of the plant. Further, they treat birds, plums, bamboos or other plants not as much in favor of their particular abstract qualities, rather, treating them as a category of elegant things. On the contrary, as for the educated scholars and literati artists, they developed a genre of plum painting–Ink-Plum as an alternative genre to convey their scholarly taste, moral pursuit, and political ideal. The monochrome plum painting aimed at amusing themselves or like-minded friends through evoking emotions and values by ink play or brushwork rather than by naturalistic representation. This distinction in painting styles of the flowering plum was also consistent with the larger social and cultural context: the scholars of the Song Dynasty formed alternative discourse in cultural production and political theory vis–à–vis the court. 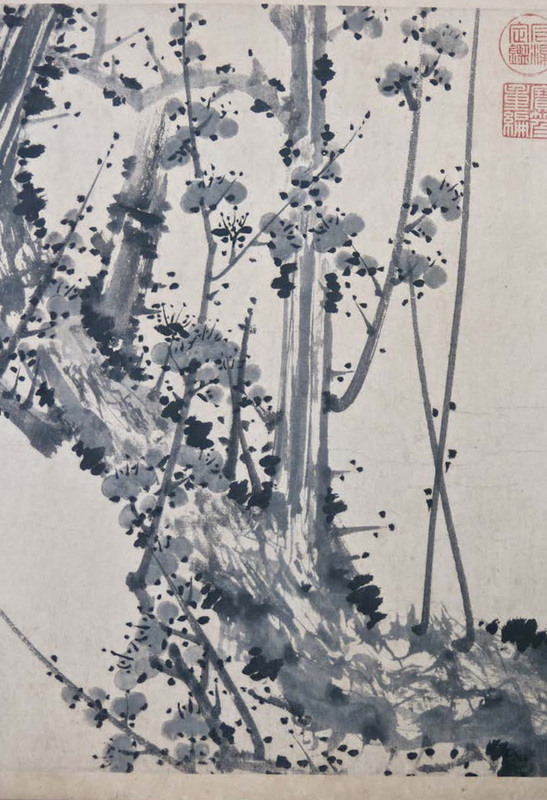 Therefore when we are viewing Yansou’s ink-plum handscroll, which treats plum blossom as the only pictorial subject and is done in monochrome ink, we need to be conscious of the social and cultural context in the Song Dynasty and the value system of the Song intellectuals. During the Song time, the imagery of flowering plum evolved into an artistic genre common in painting sand everyday objects such as clothing (for example, 7), ceramics (for example, fig. 8, 9), shoes10 and fans (for example, fig. 10). In Sparrows, bamboo, and plum blossoms, the bamboo is a metaphor of a scholar, the plum is a metaphor of a women with literati taste, and the sparrows is a metaphor of rural villagers. That the scholars befriended with farmers is a common theme in the Song Dynasty literature and arts.11 For a detailed discussion on women of literati taste in 13 century Chinese art, please refer to Martin Powers’ China Mirror case study, Women and Arts in the 13th Century. The three colophons attached to Yansou’s handscroll reveal what the scholars in the past were keen about the painting and the plum blossom. Wu Sidao (mid-late 14th century) inscribed the second colophon, which is in a format of ten quatrains, each under a name of encountering plum blossom such as seeking plum blossom, plucking plum blossom, chewing plum blossom, bathing plum blossom, and dreaming plum blossom among others. The third colophon by Jin Shi (mid-late 15th century) was a response to Wu Sidao’s inscription, adopting the same titles, format and rhyme but creating new poetry. 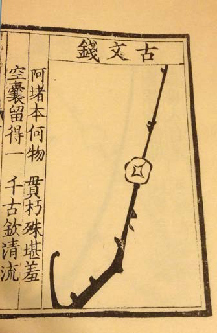 Jin Shi inscribed that “The solitary root is covered with ice and frost, I plant it in the old thatched hut of Lin Bu.”12 Wu Sidao said: “plant the solitary root of the plum blossom in the hall and wait for the spring; Lin Bu knows that I am also a like-minded with him…I love to chew the plum blossom just as tasting the snow.”13 Both of them, when mentioning “solitary root”, probably referred to the major trunk depicted in Yansou’s painting. But what does “solitary” mean here? 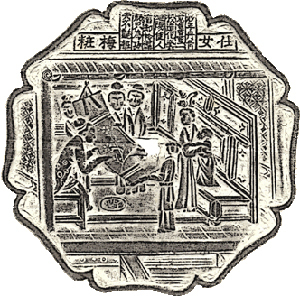 Wu Sidao and Jin Shi associated planting the solitary root with the Song scholar-recluse Lin Bu, and both gestured that their alignment with Lin Bu, who inspired the ‘flowering-plum cult’ in literature and arts of the literati. As Lin Bu was celebrated for leading a reclusive life and embracing free will, ‘solitary’ here denotes the independence of the mind that scholars and literati artists valued in the Song Dynasty. 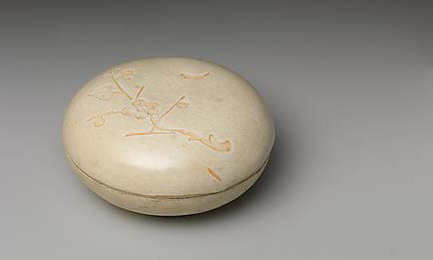 This legacy, evidenced by inscriptions of Wu and Jin, is also evocative for poets of later generations after the Song Dynasty. Likewise, to contemporary viewers as well as the inscribers of Yansou’s handscroll, viewing the ink-plum painting recalled to them not only the flowering plum in nature, but also the scholars’ values of integrity, independence and social responsibility. Moreover, the ink-plum also unveils to the inscribers and other viewers the character of the artist–Yansou. As the first colophon comments that “the tip of the brush utters the jade-like character.” “Jade-like character” here describes the pure blossoms, but it also refers to the integrity of the artist. Re-thinking Yansou’s handscroll in light of word and image inter-relation, one would recognize multiple layers of response displayed here. The colophons are not only response to the plum-blossom image, but also to the artist, to the scholar-recluses in the past, to the actual flowering plum, and among the painting’s inscribers themselves. Fig. 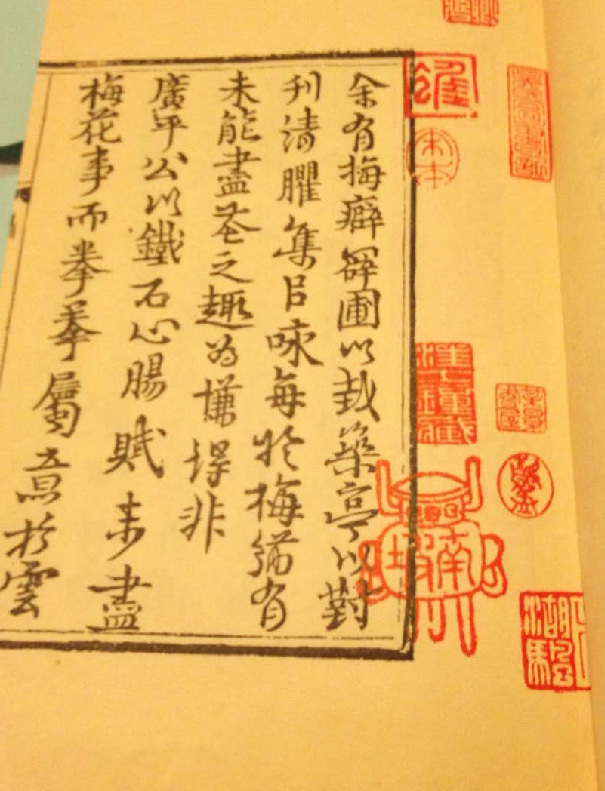 11 – Preface, Song, Boren, Manual of plum-blossom likenesses (Song Ke Mei Hua Xi Shen Pu). 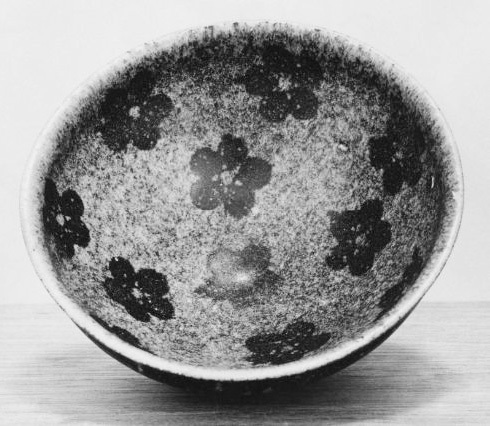 The technique that Yansou used to paint the ink-plum is termed the reverse saturation technique that appeared by the end of the twelfth century. 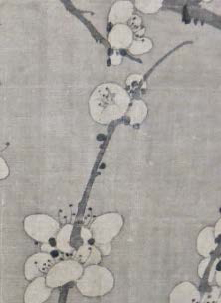 The ink wash was evenly applied to the silk, leaving reserved areas of the silk to represent the white plum blossoms. This technique was invented especially to create the atmosphere of plum blossom under the moonlight or in the snow. 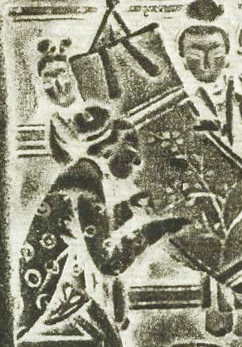 Different from the saturation technique used by Zhongren (whose painting did not survive, but the saturation technique can be traced in Zou Fulei’s painting Breath of Spring17 [fig. 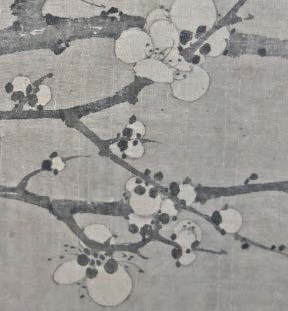 12]) who applied ink wash alone to paint the blossoms without outline, the ink wash background in Yansou’s handscroll highlights on the white and pure properties of the flowering plum. In addition, the contrast of the whitened flower and the darkened ink wash background fabricates environment such as winter after snow or a moonlit night. This makes Yansou’s handscolls more evocative of poetic scenes. Moreover, the heightened whiteness of the plum also accentuates the icy and pure quality of the flowering plum. It is not certain if Yansou’s ink-plum was made after the appearance of Manual of Plum-Blossom Likenesses, however, the forms of the ink-plum blossoms in this handscroll resemble those in the Manual. 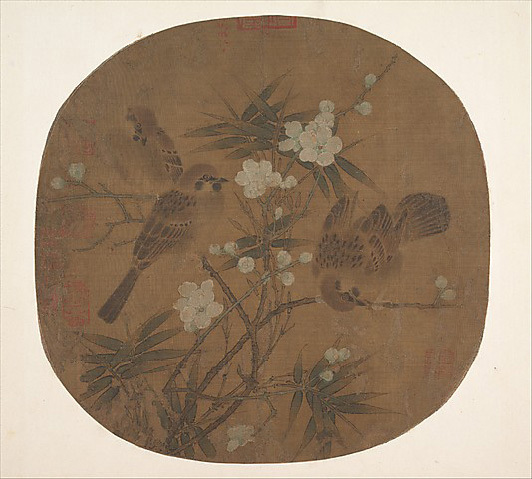 This was most likely Yansou’s deliberate choice to situate the repertoire of this painting in the larger context of scholarly style in painting plum blossom, since Song Boren belonged to the circle of scholars and literati artists. The techniques and styles that Yansou chose to paint the ink-plum serve as visual clues of Yansou’s scholarly taste and values. The painting can be perceived as a mirror image, or self-projection of the artist Yansou. This can be evidenced by the first anonymous colophon which points out: “the censorate official in his plain scholar robe resembles the horizontal and slanted plum branch over the waters.”18 As Wu Qiu-ye argued that Yansou was the Southern Song scholar He Menggui,19 who was a censorate official when this painting was made, we can infer from the colophon that the plum blossom was perceived as a projection of Yansou. Both of them had “jade-like” character, or integrity and independent mind. Therefore to scholars and literati artists, because their character match that of the plum blossom, as if the flowering plum is just a projection of themselves, they can portray the plum blossoms without intentional effort. The plum blossom itself evokes the image of a high-minded scholar. Thus, because the flowering plum in Yansou’s painting is unified with the scholar, Yansou had no need to portray another scholar appreciating the plum blossom, as what the court painter Ma Yuan (active ca. 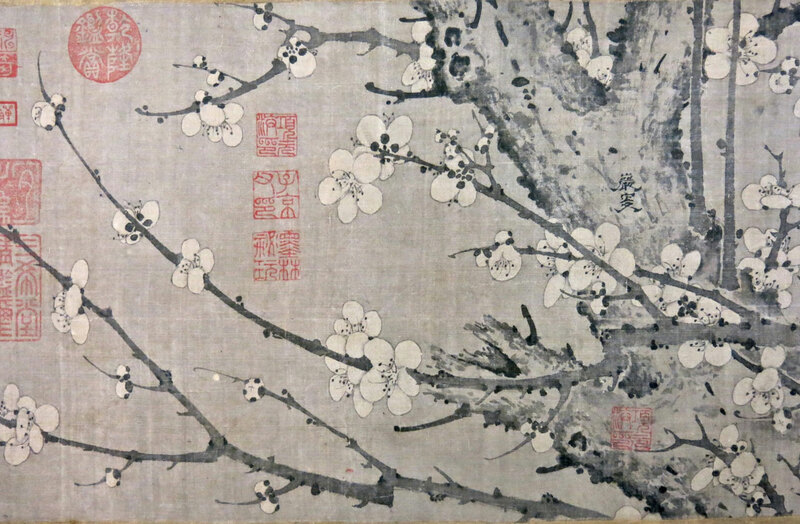 1190–1225) created in Viewing Plum Blossoms by Moonlight (fig. 15). The meanings of the Yansou’s Ink-Plum are much more condensed and so would come to the like-minded scholars naturally while viewing the painting. Fig. 13 – Page from the reproduction of Song, Boren, Manual of plum-blossom likenesses (Song Ke Mei Hua Xi Shen Pu). Beijing: Wenwu chu ban she, 1981. 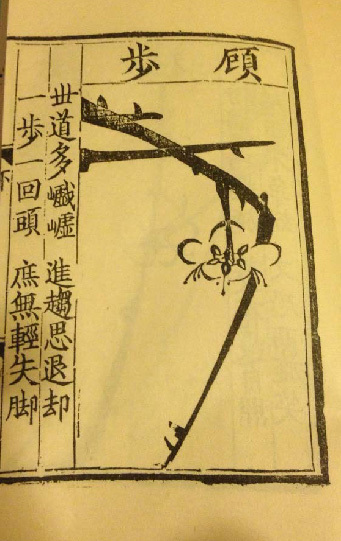 Manual of plum-blossom likenesses (Song Ke Mei Hua Xi Shen Pu). Ink Plum Blossom: WHAT'S THIS THING?